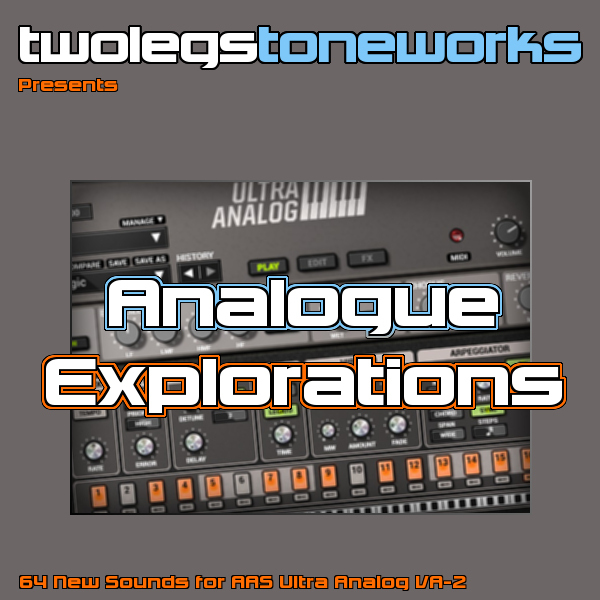 ‘Analogue Explorations’ is a collection of 64 carefully programmed analogue type sounds created for Applied Acoustics Systems “Ultra Analog VA-2” synth. The soundset is not aimed at any particular style or genre, but provides a sound-palette easily adapted in any type of electronic music – spanning the spectre from deep dubtechno, dnb, idm, chip to funky house. This pack contains a broad variety of analogue type sounds programmed with small amounts of drift and plenty of analog grit – of which this synth has plenty. You’ll find basses ranging from funky synth basses to bombastic subbasses – and pads ranging from soft baby tissue to sweeping textured wonders. There’s also a range of lead-synths well suited for the odd melody-line or a full solo-riff. Ultra Analog VA-2 doesn’t allow too much action to be applied through the modwheel, but there’s added vibrato for most sounds. The true bonus in this soundset is the percussive sounds and the instant atmosphere creating soundeffects, which in some cases can make up the basis of an entire dub techno track. Supplied in native “VA-2 Bank”-format for loading directly inside the Ultra Analog VA-2 user interface.